It is with a very heavy heart that we write to tell you of a great loss to our family. Today, we lost one of the great social justice warriors of our time, Michael Ratner. In July 2015, Michael fell ill. But he fought his illness in the same manner as he did all of the injustices he encountered for the last half century; with clarity, tenacity, good cheer, the support of his loving family and friends, and hope for the best possible outcome against the odds. Sadly, this was one fight that he wasn't able to win. We send our deepest condolences to his family and to all of those who knew and loved him. Family members say Michael was born with the "empathy gene," which made him a wonderful and loyal friend. While a law student at Columbia University in 1968 this empathy and compassion helped him find his political focus during student protests against the Vietnam War. While participating in a building occupation on campus Michael was pushed to the ground and beaten by the police. Seeing his bloodied classmates who were, like him, standing up for what's right, he decided he would always stand on the side of the oppressed and against the oppressor. A law student was pushed down; a radical rose up. In his words, "[E]vents like this created the activists of the generation and I never looked back; I declared that I was going to spend my life on the side of justice and non-violence." And this is exactly what Michael did until his last breath. After law school Michael was drawn to the Center for Constitutional Rights; it would be his political home for over 40 years. He started as a staff attorney on the same day as another lost CCR hero, Rhonda Copelon, who along with other CCR colleagues, built gender work into the Center's portfolio in the early 1970s. Through the years, Michael came to embrace international law as a key tool for the Center through the counsel of Rhonda and former CCR Vice President, Peter Weiss. This work, along with Michael's tenacity and spirit remain the defining features of CCR 50 years after it was founded. "He lived the vision for how a radical people's lawyer could almost literally shift the world for the most precarious in our society, by shifting the ground under the most powerful. But what really shifted, was me. Hearing his stories of representing clients and political movements from every corner of the globe, I came to see how I could use my law degree for something extraordinary and eternal. It was my honor to have later served with him on CCR's Board and to work in partnership as the Executive Director of the organization we both cherished." In accepting the Center's Relentless Radical Award in 2012, Michael explained why he chose to spend his career in partnership with CCR: "I believed then and I still believe today, that it is the place that will change the world. I am as excited to walk into the Center today as I was that first day. And I still believe it is the place that will change the world." Jules Lobel, CCR's Board President and frequent CCR co-counsel with Michael, shared "Michael was the moral and political compass for me and CCR. He was the spirit of the Center: his approach to litigation and working with communities, his fortitude in waging long running campaigns, and the values he held dear. These will outlive him and continue to impact CCR's work for generations." Michael had the vision to see things on the horizon-things that others barely glimpsed, often dismissed, or were convinced simply didn't exist. From his work at CCR challenging US imperialism and oppression through policies of brutal militarism from Central America, Iraq and at home, Michael stood for peaceful conflict resolution and accountability for the inevitable abuse that accompanies the use of force. He never shied away from a fight, no matter the odds; indeed, it is likely he specifically selected the cases with the longest odds. After all, those involved in these cases were most in need of solidarity, support and a legal ally. This was obvious in the years he spent dedicated to exposing conditions facing Palestinians in Gaza and the West Bank and advocating for adherence to international law and recognition of their human rights. "He was among the most visionary lawyers of our generation, holding the U.S. government accountable when it went to war illegally, tortured its citizens, withheld state secrets, limited the rights of a free press, persecuted political dissidents and in countless other contexts. There has hardly been a progressive social movement in the last 45 years that Michael hasn't been part of, contributing his phenomenally creative and cutting edge legal mind. All of us who treasure freedom and oppose oppressive state violence owe a debt of gratitude to Michael Ratner." Michael's special gift was his ability to turn an urgent problem into a meaningful, hard-hitting lawsuit. He sometimes won in court, but he always won in the court of public opinion; even if it took the rest of the world a decade to get there. Among his many iconic wins was gaining freedom for HIV+ Haitians held at Guantánamo Bay in 1993. This experience prepared him to recognize what was at stake when the first men were transferred to Guantánamo in 2001-he knew that this was an attempt to place them beyond the reach of the law, the courts, reporters or lawyers. Within months of the 9/11 attacks Michael had made a compelling case for why CCR, alone among U.S. organizations, and at the great risk of losing support, should take up the challenge to these detentions. Michael dedicated his life to the most important justice causes of the last half century. He was the second wave of people's lawyers at CCR, its first Legal Director, and longtime Board Member and Board President; and as such helped shape the course of the work for four decades. He is survived by the legacy he created at CCR. We were undeservedly fortunate to have had so much of Michael's vision, time and leadership over these many years. We send his wife Karen Ranucci, and children Jake and Ana, and the rest of his close-knit family a heartfelt embrace from the entire CCR family. We close with Michael's words: "There is not the same sense of strength in struggle that you can change things, not as there was in the `60s and `70s. You get to the point where you have a very conservative government and you feel like you are only a flickering light. But we have to keep the light lit." 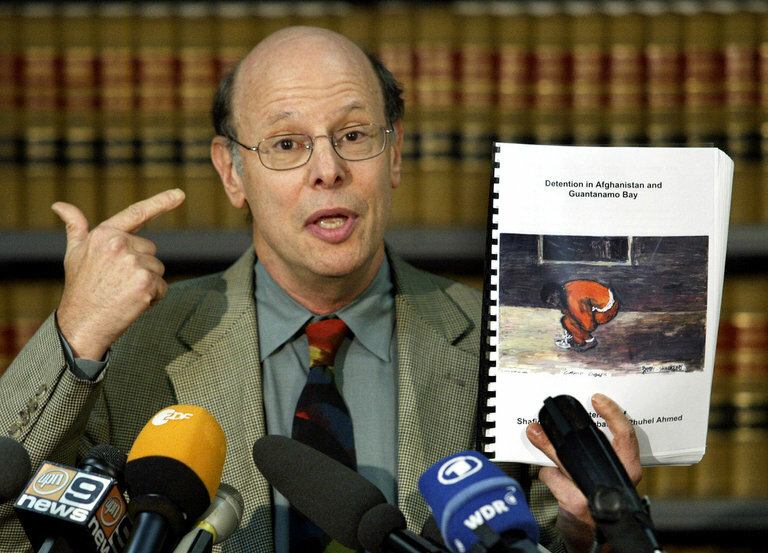 Michael Ratner in 2004 discussing a report by the Center for Constitutional Rights about the life of Guantánamo detainees. Michael Ratner, a fearless civil liberties lawyer who successfully challenged the United States government's detention of terrorism suspects at Guantánamo Bay without judicial review, died on Wednesday in Manhattan. He was 72. As head of the Center for Constitutional Rights, Michael Ratner oversaw litigation that, in effect, voided New York City's wholesale stop-and-frisk policing tactic. The center also accused the federal government of complicity in the kidnapping and torture of terrorism suspects and argued against the constitutionality of warrantless surveillance by the National Security Agency, the waging of war in Iraq without the consent of Congress, the encouragement of right-wing rebels in Nicaragua and the torture at the Abu Ghraib prison during the Iraq war. "Under his leadership, the center grew from a small but scrappy civil rights organization into one of the leading human rights organizations in the world," David Cole, a former colleague at the center and a professor at Georgetown Law School, said in an interview this week. "He sued some of the most powerful people in the world on behalf of some of the least powerful." "He was part of a generation of lawyers that was absolutely bold and that understood the political aspects of law," his former wife, Margaret Ratner Kunstler, a civil rights lawyer, said this week, "and that was not afraid of bringing a lawsuit that was going to lose if it was going to support the community." "This was a case that was regarding a fundamental principle, going back to the Magna Carta in 1215, about the right to have some kind of a hearing before you get tossed in jail," Mr. Ratner told Mother Jones magazine in 2005. Professor Cole said Mr. Ratner's tenacious advocacy not only gave the detainees the right to their day in court, but also culminated in "the first Supreme Court decision in history to rule against a president in wartime regarding his treatment of enemy fighters." "When I asked him, several years later, what he thought his chances were in filing that suit," Professor Cole recalled, "he answered: `None whatsoever. We filed 100 percent on principle.' That could be his epitaph." Michael David Ratner was born in Cleveland on June 13, 1943. His father, Harry, was a Jewish immigrant from Russia who ran a building supply company. His mother, the former Anne Spott, was a secretary and helped resettle refugees after World War II, during which scores of the couple's relatives were killed in the Holocaust. Michael Ratner's college radicalism had deep personal roots. His father once gave shoes to a homeless man who came to the door seeking a handout. His mother refused to enter a Florida airport because it was racially segregated. Mr. Ratner recalled in an interview with The New York Times in 2002 that as a boy he had dreamed of becoming an archaeologist, adding: "I used to think it wasn't political, but it turns out to be highly political. After all, what layer of civilization do you save?" In 1971, he joined the Center for Constitutional Rights, a nonprofit organization with headquarters in Manhattan, which litigates civil and human rights cases and was co-founded in 1966 by William Kunstler, whom Mr. Ratner's first wife later married. Mr. Ratner's first case with the center involved a suit on behalf of inmates killed and injured at the Attica Correctional Facility in upstate New York after a bloody uprising there in 1971, although the court ruled that it could not compel prosecutors to indict prison guards or the state troopers for their actions. He was the center's legal director from 1984 to 1990 and its president from 2002 to 2014. He was also president of the National Lawyers Guild and of the European Center for Constitutional and Human Rights, and founded Palestine Legal, which defends protesters on behalf of Palestinian rights. Mr. Ratner defended Julian Assange and WikiLeaks for disseminating millions of secret American government documents; served as a counsel to Jean-Bertrand Aristide, the Haitian president, in the prosecution of war crimes; and advocated on behalf of Haitian refugees held at Guantánamo after the 1991 coup that overthrew Aristide, the country's first democratically elected president. He is the author of "The Trial of Donald Rumsfeld: A Prosecution by Book, Against War With Iraq" (2008) and "Guantánamo: What the World Should Know" (2004). "He felt very much that torture doesn't make us safer, and that everyone needs a defense," Ms. Ranucci said. Speaking to The Times in 2002, Mr. Ratner said: "A permanent war abroad means permanent anger against the United States by those countries and people that will be devastated by U.S. military actions. Hate will increase, not lessen; and the terrible consequences of that hate will be used, in turn, as justification for more restrictions on civil liberties in the United States." By Bob Guild, Vice President, Marazul Charters, Inc.
Michael Ratner, president emeritus of the Center for Constitutional Rights, former president of the National Lawyers Guild, and best of the best people's lawyers, died yesterday. In addition to everything mentioned in the announcement from CCR and the article from the NY Times, Michael was the first attorney for the Venceremos Brigade, a fierce defender of the Cuban Revolution and the Cuban Five, opponent of any and all U.S. restrictions on travel to Cuba and of the continuing economic blockade of Cuba, and coauthor with William Smith of "Who Killed Che? How the CIA got away with murder".